It pains me greatly that I never got around to seeing Captain America in the theaters. What can I say? I’m always drinking working so I just never got a chance and before I knew it, it was gone. But, hey, that’s what my BD Player and huge TV are for. Nonetheless, watching Thor again this week got me craving some new Marvel movie stuff and that included a bunch of Captain America figures. I was mainly going to cherry pick this line for characters other than Cap, but when I saw this version, I just couldn’t resist. I’ll reiterate what I said about the packaging for the Thor figure review. The movie Marvel cards are pretty sweet and I like Captain America’s the best. You get an image of Cap up in the left corner and the Avengers Assemble icon over in the right. 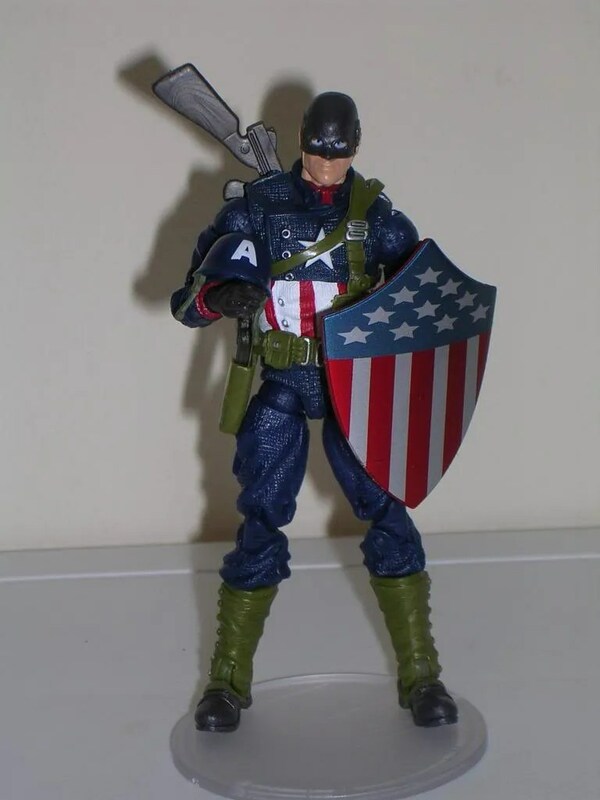 Cap is carded with both his weapons displayed and his shield beside him. The best thing I can say about any carded figure is that I was sorry to rip him open. I might actually pick up an extra of this guy to hang carded on my wall. He really does look that great in the package. 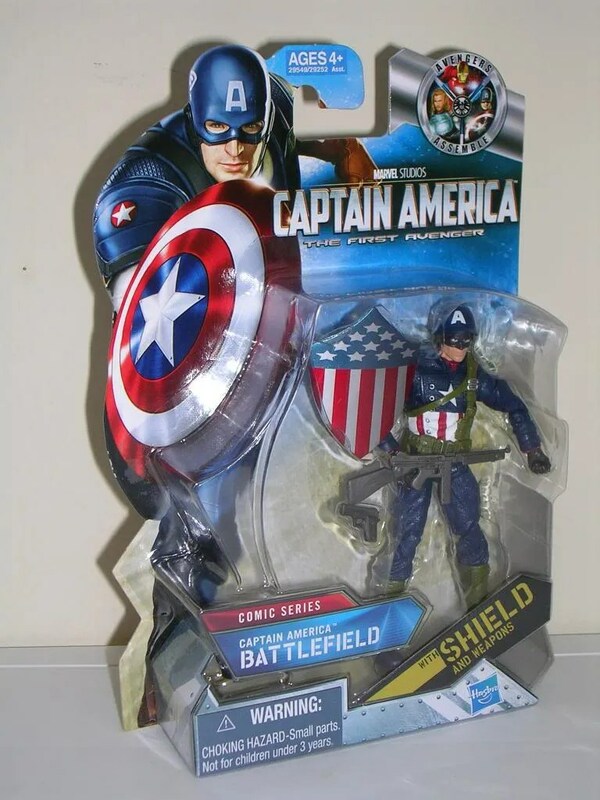 Battlefield Cap is out of the package and… damn. He’s an amazing sculpt. Sure, he’s basically a standard modern Hasbro 3 3/4″ body, but his entire suit is textured, and there’s a ton of little details like the treads on his boots and the flap and buttons on his tunic. The pounches are sculpted and even the star on his chest is sculpted on rather than just a tampo or paint app. His web gear is a separate, removable piece, with a working holster, sculpted ammo pouches and canteen. Nice! The head sculpt is nice, with a grey mask/hood and his blue combat helmet is removable. This figure would be a Triple-A slam dunk, if it weren’t for how soft the plastic in his legs is. It’s not a dealbreaker for me, since everything else about Cap is amazing, but it is annoyingly soft. The paintwork is just as good as the sculpt. He’s mostly blue with some red trim and green and brown on his boots and the red and white striping on his mid section. I’m most impressed by the fact that every single one of the little buttons and buckles on him is painted silver. There’s no slop or bleeding either. Nice! Articulation is standard modern 3 3/4″ Hasbro with a few nice surprises. 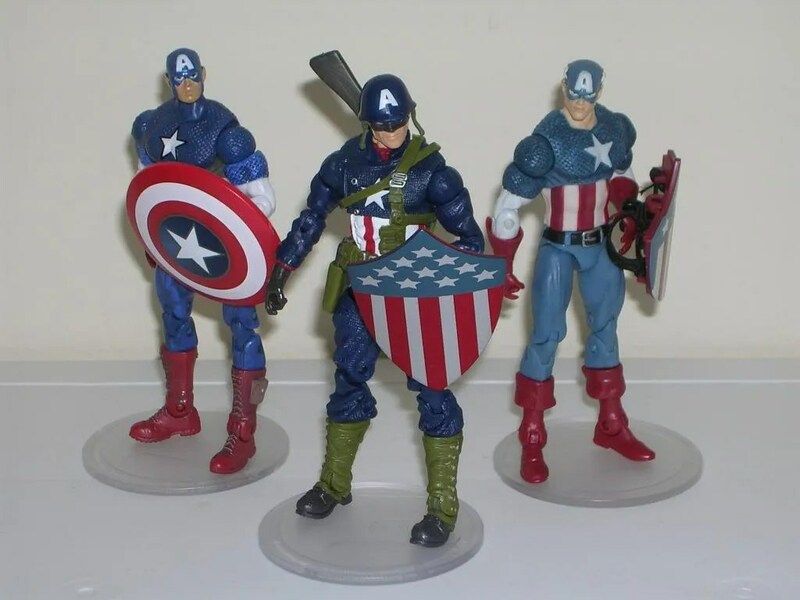 Cap’s neck is ball jointed. His arms are ball jointed in the shoulders, hinged at the elbows, there are swivels in the biceps, and even ball joints in the wrists. His legs have those annoyingly awkward ball joints in the hips, double hinged knees, swivels at the tops of his boots, and his ankles feature both regular hinges, and lateral rockers to keep his feet flat at wide stances. His torso features that standard Hasbro ab ball joint. 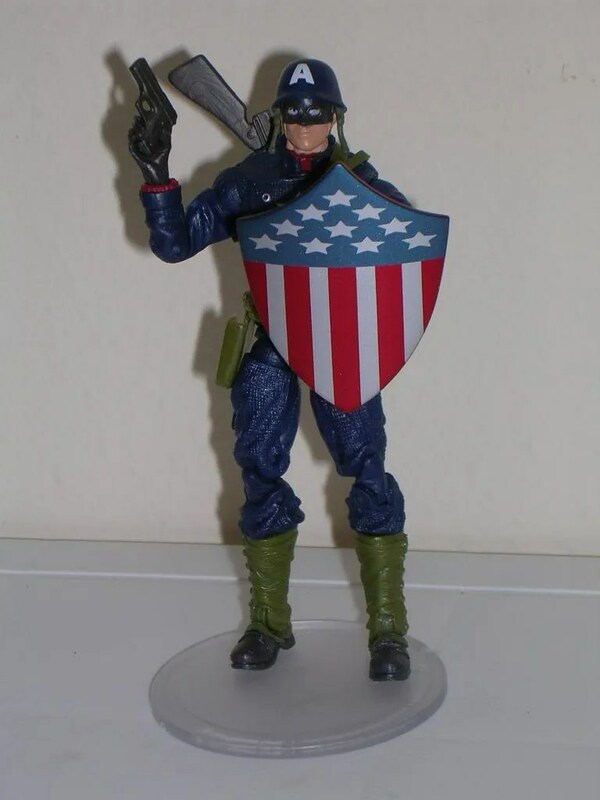 Cap’s accessories include an automatic pistol, a Thompson machine gun and his trusty shield. 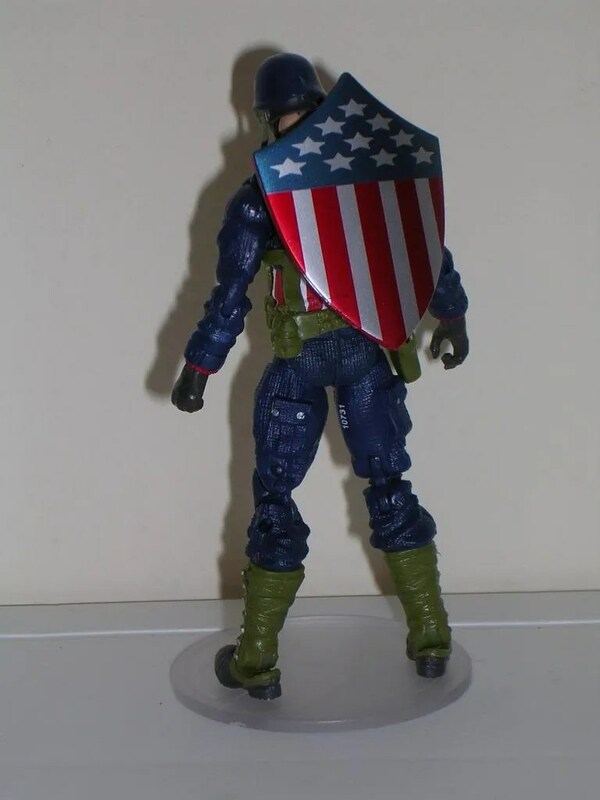 The shield clips onto his wrist, but also has a peg that allows him to store it onto his back. You can even tuck his Thompson into his web gear strap and store it on his back and the pistol fits into his holster. 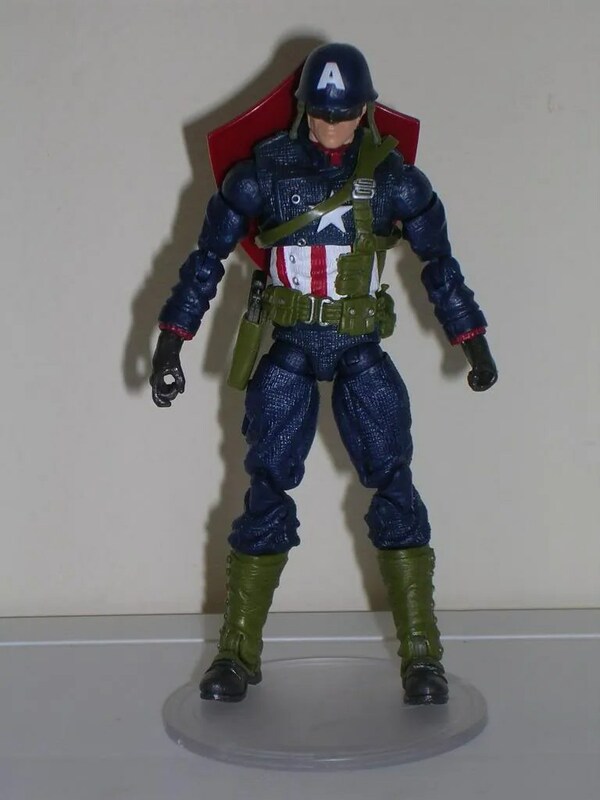 In a line that is stuffed with predictably awful variations on poor Cap, this Battlefield version stands out as being an absolutely amazing figure. Seriously, stand him next to the likes of whatever Desert or Arctic flavor Cap figure from the line you want and tell me he really looks like he’s some kind of special exclusive stand alone release. Sculpt, paint, accessories, articulation: This figure hits all the points dead on and suffers only from some unfortunate use of soft plastic in the legs. I picked him up for just under eight bucks, and what a deal it was. 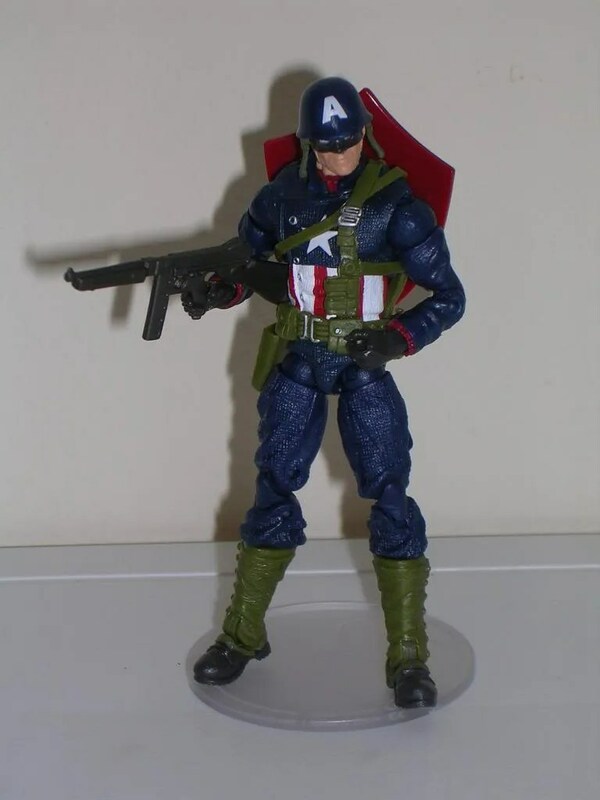 He won’t satisfy anyone looking for a standard Cap to stand in with your Avengers, but if you’re a fan of Steve Rogers, you really should have this one on your shelf.